Blunt Umbrellas – why didn’t I think of this? This is one of those inventions which seem so glaringly obvious… yet I didn’t manage to think of it! Yes these are Blunt Umbrellas and I’m kicking myself for not coming up with it first. I’ve been dodging umbrellas all week as it’s been rainy and I’ve been trying to keep up the school runs on foot to get some exercise. Those spiky bits at eye level are enough to terrify anybody – childbirth is nothing compared to confronting a random spike in the eye! My three-year-old is in umbrella training – he still has no idea really – but one of these would see us happily and safely going through the learning process. Why on earth do they make umbrellas with dangerous protrusions anyway? There are three handy models to choose from; Blunt ($89), Blunt XL ($99) which can fit two people and Blunt Lite ($79) which weighs a teeny 455 grams. Oh boy, a bright red or yellow one has just gone to the top of my wishlist; that familiar heart swell means it’s love! 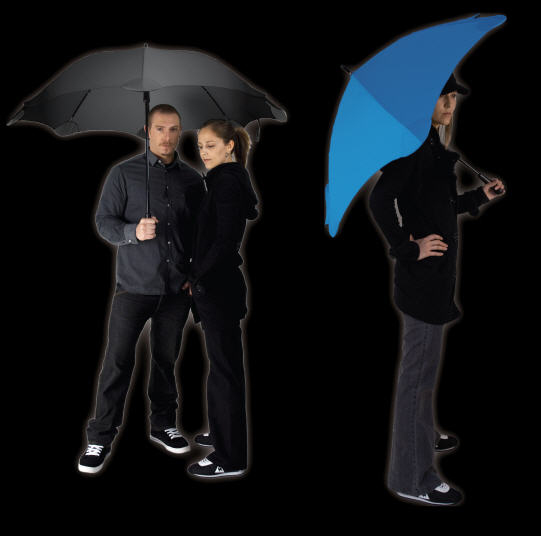 Buy direct from Blunt Umbrellas which has an Australian site, or see the list of stockists.